Did you know that if you don’t floss, you’re missing almost half of the surface area of your teeth? That’s right – this element of your dental hygiene routine may be the one that you skimp on the most, but this leaves your oral health at risk. Since bacteria thrives in the crevices between teeth, and no toothbrush can reach these tiny spaces, flossing is the best way to remove this detrimental substance and prevent gum disease and tooth loss. So, how can you make flossing enjoyable? Follow these top five tips from your dentist in Ocala, FL – the team at Weldon General & Cosmetic Dentistry shares their expert advice here. What Are The Top 5 Easiest Flossing Tips? Once teeth fit together closely, patients should start flossing – which means you should begin around ages 2-6 and continue this habit your whole life long. Dr. Daniel Weldon offers the five best ways to improve your flossing routine. Sounds easy enough, right? Although most of us have been flossing our entire lives, our skills sometimes become rushed or sloppy. Make sure to take your time and gently slide the floss in between teeth, moving in a c-shape to get the gums in on both sides of each tooth. Need to brush up your flossing skills? Watch this quick video. No matter how great your flossing technique is, it doesn’t count if you don’t do it as frequently as you should. We recommend flossing twice a day, every day – and, if you eat treats like popcorn or berries with small seeds, do yourself a favor and get the food particles out with an extra round of flossing after you’re done enjoying your snack. A lot of people floss and then brush, which is actually the wrong order of operations. Many of us imagine the floss moving the bacteria out from between your teeth, and your toothbrush sweeping it away – but, this isn’t what happens. When you floss first, you miss out on the full benefits of your toothpaste. So, brush first and spit out most of your toothpaste, but reserve a little – then floss. This will move the toothpaste in between your teeth and help kill bacteria. Flossing isn’t secondary to your oral health, but it should be done second during your routine. Many people don’t floss because it hurts, which only compounds the problem of gingivitis and can lead to periodontal disease and tooth loss. If you skip this habit because it’s painful, try switching to a satin style dental tape, and always used waxed floss – this safe, protective coating makes it easier to slide between teeth, lessening trauma to sensitive gums. We’re realistic – we know that even if patients should floss twice a day, they probably only get to this once. If you can only floss once a day, do it before going to bed. Timing is everything – since your mouth dries out during sleep and bacteria can multiply exponentially while you sleep, flossing before bed is essential. 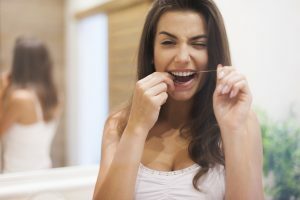 Now that you know the best ways to up your flossing game, schedule an appointment with your family dentist in Ocala, FL for more pro tips and get the professional care your teeth and gums deserve!